If you listen closely and long enough, every rivulet, stream and river has a song – each note, measure and verse comprised of every force that has ever shaped it and every creature that has ever drawn life from its waters. And if these watery lifelines have songs, then their most striking melodies are sung by its most charismatic and vocal citizens, the birds. 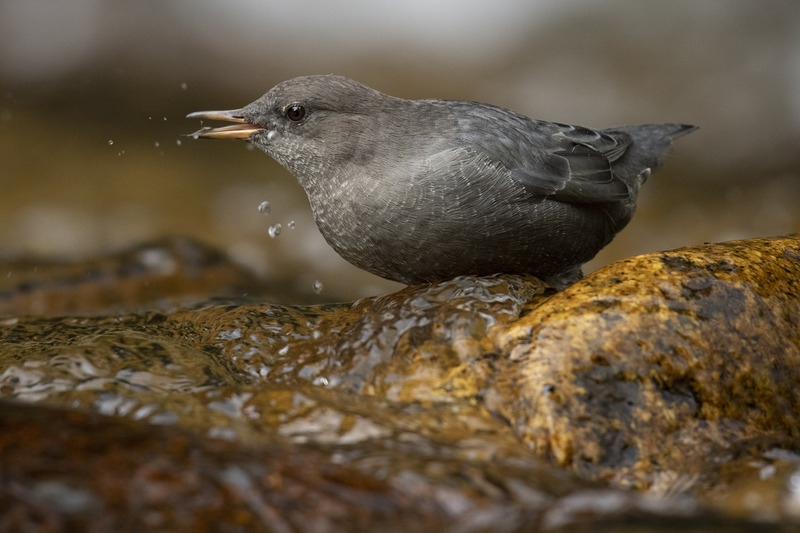 The American dipper (otherwise known as “Ouzel”) is a stalky charcoal-gray bird with a short tail and long legs that routinely swims and dives underwater to capture its food. 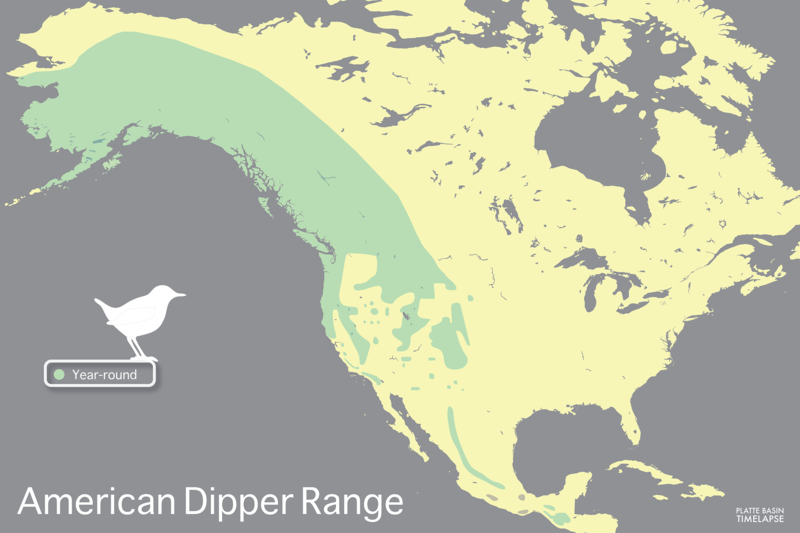 It is one of five subspecies of dippers worldwide but is the only one found in North America. On the braided shallows of the Platte River, it is the great pulsing chorus of cranes and waterfowl on migration in spring. On a meandering prairie creek in the Nebraska Sandhills, it is the sweet rolling sonnet of sparrows and larks in summer. 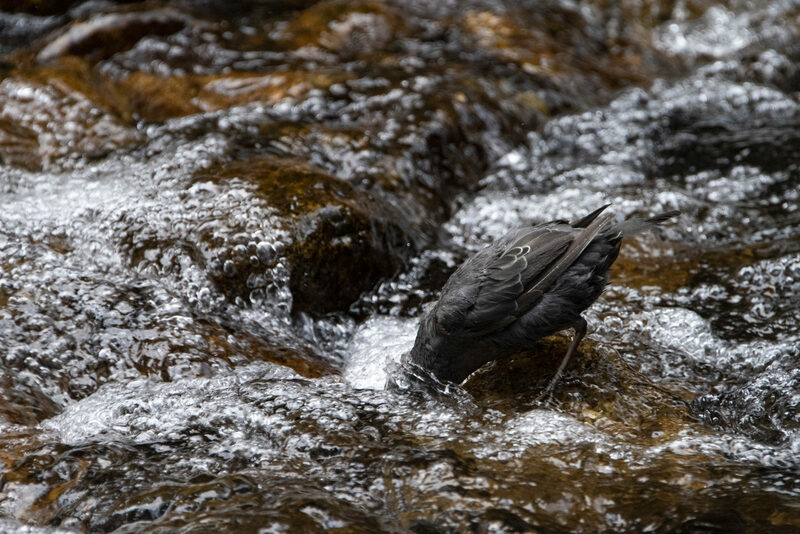 And along the swift tumbling streams high in the Rockies, it is the bright frolicking solo of the American dipper – North America’s only aquatic songbird. Rocks tagged with whitewash signal dipper territories, a sure sign of the bird’s presence along a stream. 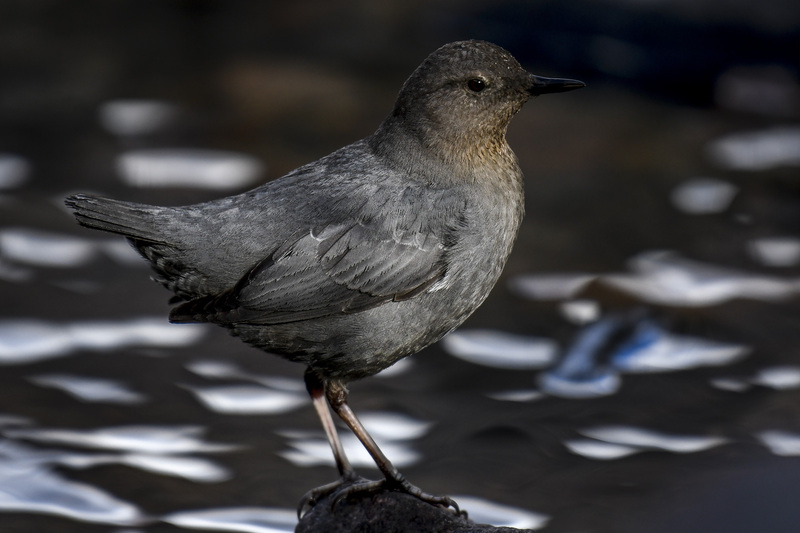 I first got to know the American dipper when I was a teenager on a family trip to Rocky Mountain National Park, Colorado. We had signed up for a ranger-led hike and trout fishing excursion. Our guide, Jerry Spangler, made a point to show us something noteworthy about the natural world at every turn, and when we arrived at our destination, he leaned over to me and gestured to a chunky, charcoal-gray bird along the inlet of the lake where the cutthroat trout were spawning and I would take my fishing spot. At first, I was much more intent on trying to tie a fly onto my leader and catch those beautiful fish, than I was on watching a bird repeatedly bobbing up and down, hopping on rocks and weirdly dunking his face underwater. But when that same bird suddenly flew and landed on a boulder next to me and started to sing, he got my full attention. His sweet song and that singular moment have lingered in my mind to this day. 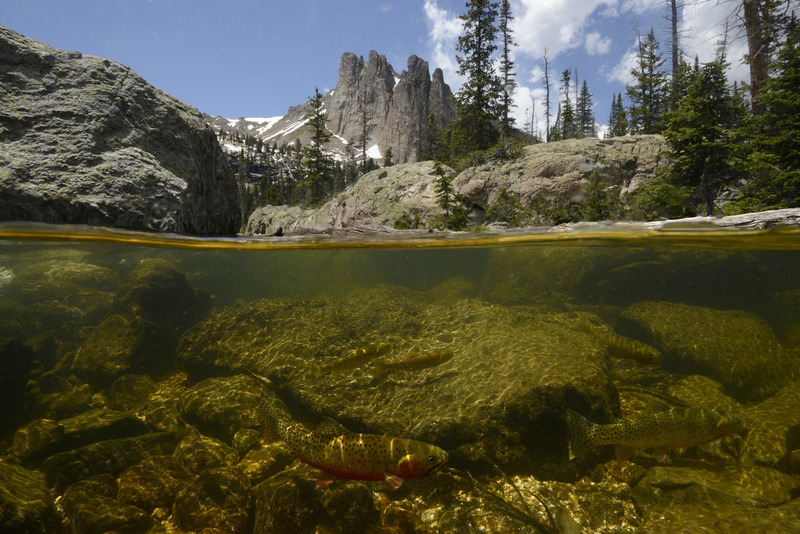 Cutthroat trout gather to spawn at the inlet of a remote alpine lake in Rocky Mountain National Park, Colorado. Trout and dippers live together in the upper reaches of watersheds, sharing habitats and the same diet of aquatic insects. Through college and into my 20’s, I wandered many mountain streams, a flyrod in one hand and a camera in the other, and a dipper would often be my companion. But it wasn’t until later, long after I had traded a fly rod for a camera full-time, and when I began looking at my home watershed – the Platte River – did I see the connections from the mountains of my youth to the water in my drinking glass at home, 500 miles downstream in Nebraska’s eastern plains, and how this little bird and I were so bound together. Prime dipper habitat is fast flowing, rocky, cold-water streams with abundant food sources and good water quality. This dipper is perched on a fallen log that eventually will break down and recycle nutrients back into the stream, giving life to aquatic creatures that will in turn provide sustenance for dippers, trout, and other species in the local food chain. The American dipper (Cinclus mexicanus), otherwise known as Ouzel (pronounced ooz-el), is akin to a trout with feathers. They make their homes along swift cold-water streams, usually in high country, living in a beautiful yet harsh and violent world. 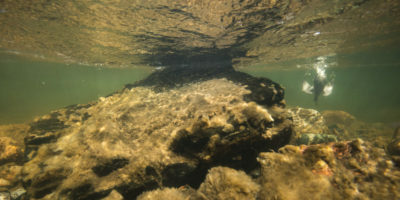 They eat what trout eat – wading, dunking and diving through riffles, pools and rapids, hunting for a steady diet of aquatic insects, and sometimes even small fish and fish eggs. Once I even saw a dipper suddenly shoot up from the water to snag a mayfly out of the sky like a flycatcher, then drop back down to eat it on a boulder before diving underwater again, headed upstream. In late summer, a dipper walks up a small cascade dunking its head underwater repeatedly in what is called a “wade-plunge” searching for aquatic insects. Dippers hunt by walking, swimming and diving, primarily feeding on aquatic insects and sometimes small fish and fish eggs. 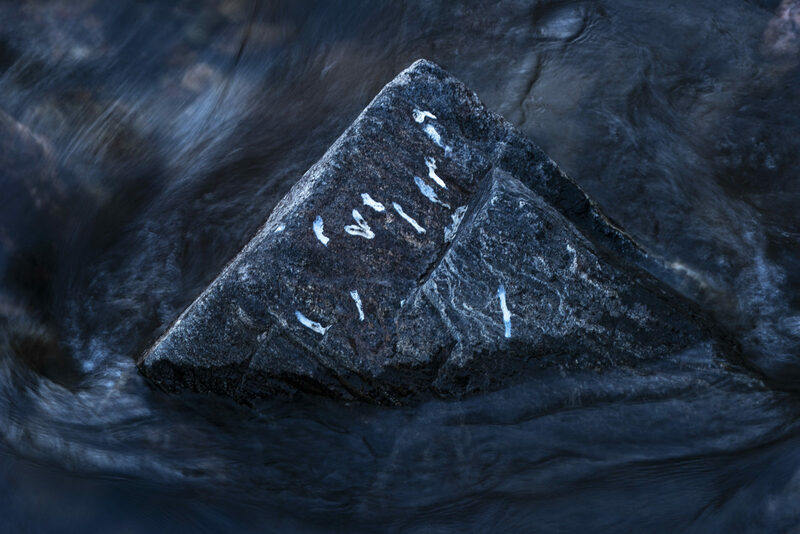 During breeding season, dippers build volleyball-sized, dome-shaped nests just above the high-water mark on rock faces, bridges and diversion structures, and sometimes even behind waterfalls. They are meticulous, versatile builders whose nests are comprised of bits of the entire range of plant communities that make up their riparian habitat. Dippers construct an earth lodge shaped nest about the size of a volleyball, with a hole in the middle as an entrance. 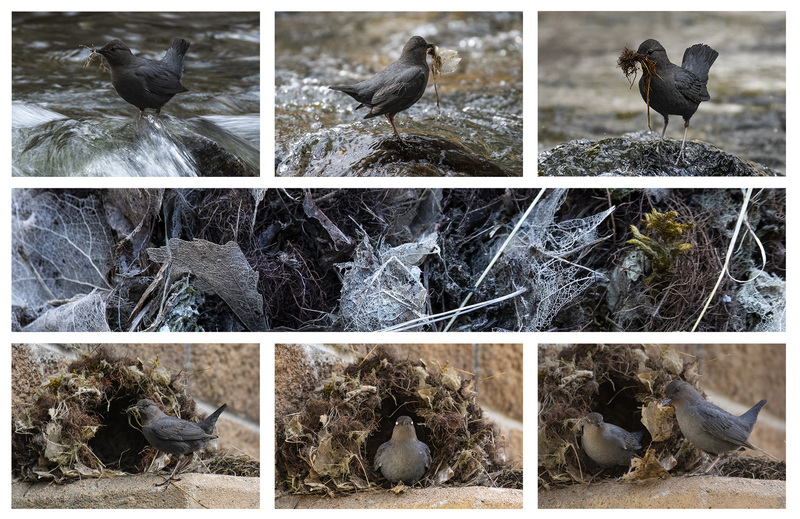 The specific materials used in nest construction (leaves, needles, moss, rootlets, lichen) represent the diversity of plant communities that comprise the dippers riparian home. Dippers move into their nesting territories early in the spring while snow and ice still linger. Their territories can be just a few hundred yards to over a mile long. Both adults work together to construct the nest. The female will eventually lay 4-5 eggs and, while she sits sheltered in her earthen lodge-shaped home, the male will bring food to her. When the chicks hatch after 14 days of incubation, acquiring food becomes a full-time job for both adults, and they are in constant motion to fill multiple begging mouths. A dipper’s nest territory can stretch from a few hundred yards to over a mile. 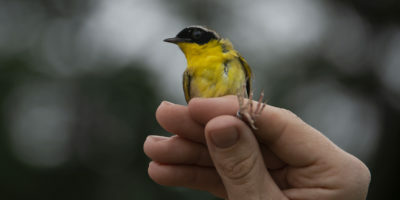 In the spring, they must negotiate high water from snowpack runoff, frequent storms and occasional floods while building nests and raising chicks. Late last spring, during a several-day vigil at a nest in Colorado’s Poudre Canyon, I made a point to record a hash mark in my journal each time a parent flew in with food to feed their 4 hungry chicks. From 530am sunrise to 800pm sunset, my tally was a staggering 260 times! This averaged out to a food delivery every 3 minutes. Imagine all the energy burned by the parents that must also feed themselves – and to do that all day, every day, for roughly a month until the chicks fledge. The male dipper feeds the female and guards the nest while she sits on eggs or broods the chicks. However, both adults share in feeding the nestlings as they grow. It takes dipper nestlings roughly a month before they fledge. Dippers may raise two broods during the summer, a necessary strategy as flash floods and severe weather events can destroy nests, washing eggs and nestlings downstream, especially early in the season. 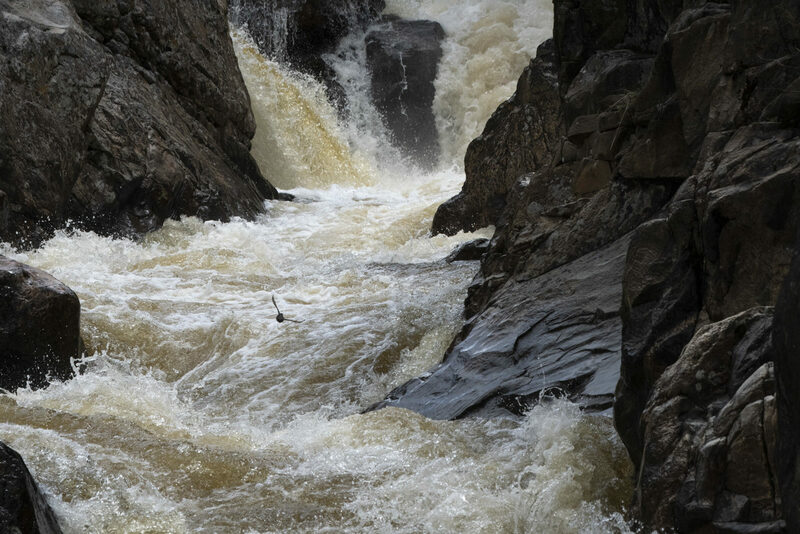 A week after my vigil at that nest, a rainstorm coupled with high temperatures and rapid snowpack runoff raised the river to flood stage, and the nest, its chicks and all that strenuous effort was washed away. A recently fledged dipper finds food in a shallow stream. After it leaves the nest, new fledglings may linger and continue to be fed by the parents, but those that survive quickly learn to find food on their own. 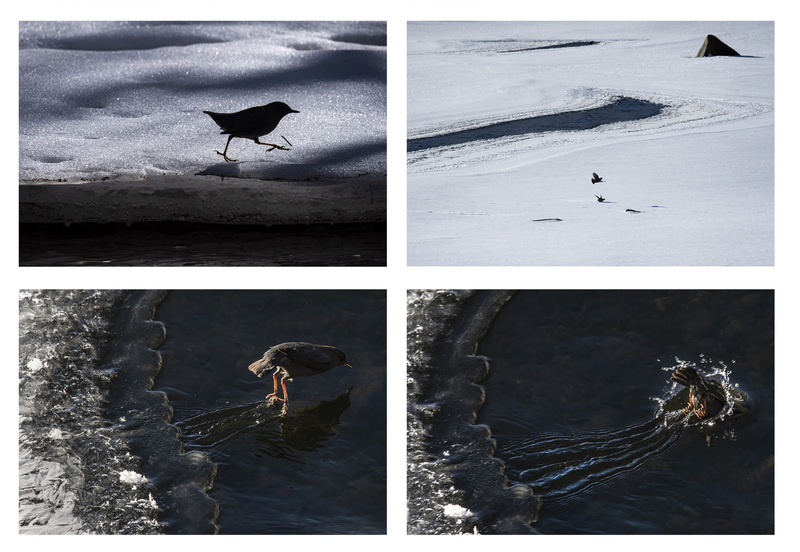 After breeding season, dippers become vertical migrators, spreading out from their nest territories, often wandering up higher into drainages to newly revealed food sources as snows retreat.  In winter, they move back down the watershed, often congregating together around stretches of ice-free open water that holds enough food underneath the surface to sustain them. Survival is hardest in the depths of winter, and times can be lean, but even in snowstorms and subzero temperatures, dippers seem undaunted. Where most birds are usually silent in winter, dippers sing. It is that song that puts a sparkle in the eye of Heather Knight. Years ago when I first met her, she was the land steward for the Nature Conservancy’s Phantom Canyon just upstream of Fort Collins, Colorado. We were walking a river trail along the North Fork of the Poudre River, and Heather was talking about the dipper’s presence on the preserve and their beautiful, trilling song. As if on cue, a dipper came zooming around the bend of the river, taking the corner like a race car and with a “Zeet! Zeet! Zeet!” whizzing through our frame of view. In winter, dippers will move to lower elevations and often congregate around patches of open water where they will feed and sometimes scuffle over feeding territories. With a ready food supply, dippers can survive in extreme cold thanks to their low metabolic rates and extremely high feather density, including fully-feathered eyelids. Later, Heather would introduce me to David Leatherman, retired forest entomologist for the Colorado State Forest Service, author and intrepid birder, whose poetic description of how a fallen pine tree gives life to a stream, had once brought me to tears, and who, with one email to his network of birders, had dozens of generous people offering up locations and anecdotes of dippers for me, all along the Front Range. One of those persons was Steve Den, a retired schoolteacher, former Harley rider, and rock-n-roll-loving man with a heart as big as the mountains, and a poodle affectionately named Bear. Steve lives in the village of Poudre Park in Poudre Canyon, but he grew up at the other end of the watershed in Plattsmouth, Nebraska, where the Platte joins the Missouri River on its long journey to the Gulf of Mexico. Steve proudly hangs a Nebraska Cornhusker flag outside his modest cabin he calls “The Den,” and his backyard has been the Cache La Poudre River for almost four decades now. Those waters run deep through his veins. Dippers retain their down and have a higher density of feathers than any other bird of similar size. To maintain those feathers, they need to frequently preen throughout the day, anointing their feathers with oil gleaned from a large gland near their tails. Despite 2 knee surgeries in the last 3 years, Steve was my scout, advocate and guide who not only found dipper nests up and down the canyon, but also assigned each of them a name (The Ledgers, Meatball Bridge, Stairway to Heaven, to name a few). Most importantly, he now affectionately calls me his neighbor downstream. We are all connected. 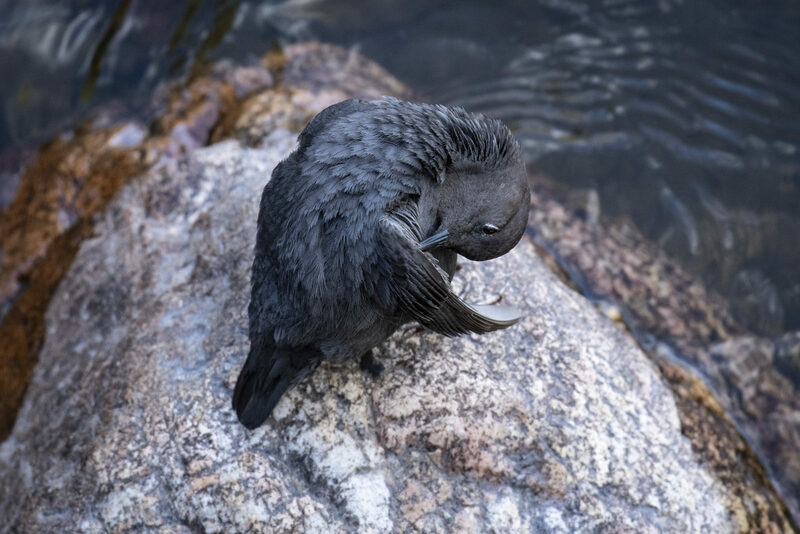 Today American dippers are neither federally listed as threatened nor endangered, but they are critical indicators of ecosystem health and the quality of water in cold-water streams. In the upper reaches of watersheds, dippers are more protected from direct pressures of modern development, but they are not immune to pointed sources of pollutants. Old mineral mines, abandoned, forgotten or never reclaimed, can still leach toxic chemicals into streams that may deceptively appear, at a distance, as part of an idyllic mountain postcard scene. A mink glides along the streambank above and below water as it hunts its way downstream. A dipper has many natural predators to look out for including goshawks, raven, river otter, and mink, not to mention the risks of living in a beautiful yet often violent mountain world. In lower parts of the watershed and on wintering grounds, they will be increasingly compromised with dam and diversion and urban development as we press further into the mountains, all activities with the potential to alter natural flow regimes. Then there is climate change with downward trending annual snowpack, more rapid runoff caused by spiking winter temperatures, beetle-killed forests and wildfire-torched soils that inhibit the land’s ability to absorb water like a sponge and release it slowly as the land needs. Like the range of their brethren the native cutthroat trout, I imagine the American dipper’s range too will shrink, as they are forced to live higher and higher up watersheds, increasingly squeezed by pressures from all sides. For a bird that evolved over millennia, finely tuning its life cycle to nature’s rhythms of healthy rivers and streams, the dipper serves now as our watershed messenger in the high country, a modern “canary in the coal mine,” if you will, and what their populations tell us is important: if the quality of their future is uncertain, so is our own because issues in any watershed accumulate downstream. In early June, rafters race past a dipper nest on the Cache La Poudre Riverleft). A female western tanager lays lifeless along the river’s edge after mistaking a fisherman’s left behind artificial fly for an aquatic insect. The bird, fishing line and fly were snagged in a tree. Dippers and other riparian wildlife face numerous threats from pollutants, water diversions, increasing urban and recreational pressures, and climate change. 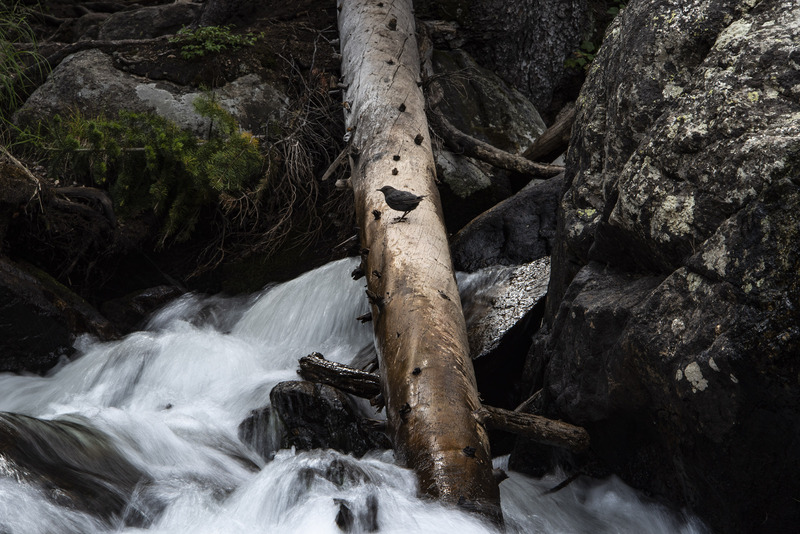 It has been over 30 years since I first encountered these remarkable little birds in the Colorado high country, and I still return each year to a particular trail that most of the way parallels a mountain stream. There at a certain point I veer off trail down a hill and tuck myself away in a pocket of sunlight along a moss-covered bank to listen and to wait. 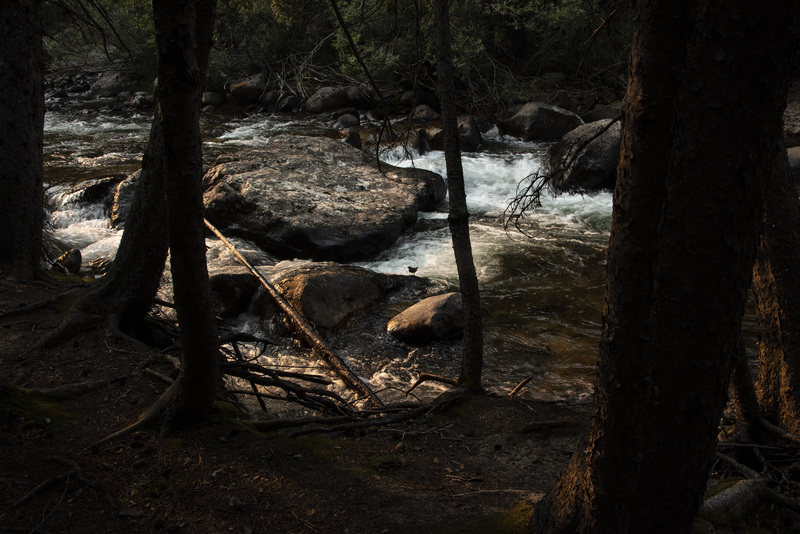 In this place, water dances chaotically among millions-year-old granite boulders. It rushes and gurgles, pitters and patters, ticks, bubbles and pops, making its way downstream. And beneath that bed of sound there is another, and if I really un-focus my hearing (like solving an acoustic Rorschach puzzle), I can almost detect the rolling melody of Pink Floyd’s “Wish You Were Here,” pulsing in similar tone, rhythm and beat. Above me, aspen quake in the upslope breeze as the sun, tracking across the sky, flashes through arrow-straight pines. And here if I wait long enough, a dipper will almost always take center stage, singing his heart out with crisp trills and whistles, while dunking, diving and dipping at the knees, and in that bright moment, the world is complete. An American dipper closes the day, pausing to sing on a rock under a smoky gold sunset along Ouzel Creek in Rocky Mountain National Park, Colorado.